Towards the end of research for my forthcoming publication, Dame Maggie Scott: a life in dance, an item relating to Joanna Priest’s ballet The Listeners emerged, quite unexpectedly. I had briefly looked into The Listeners as it was one of the ballets performed during the opening season by the National Theatre Ballet in Melbourne in September 1949. This was the occasion when Dame Margaret Scott made her return to the stage, following a lengthy stay in St Vincent’s Hospital, Sydney, during the 1947—1949 Australasian tour by Ballet Rambert. The appearance of this previously unknown item (unknown to me anyway) prompted me to look at The Listeners in a little more depth. My main source for further investigation was a Laban score for the work, part of the small collection of notated scores acquired by the National Library of Australia from Meg Abbie Denton in around 2004. Further information came from Meg’s publication Joanna Priest: her place in Adelaide’s dance history (Adelaide: Joanna Priest, 1993), and Alan Brissenden’s and Keith Glennon’s Australia dances: creating Australian dance 1945–1965 (Adelaide: Wakefield Press, 2010). The Listeners was first staged for the South Australian Ballet Club in Adelaide on 30 November 1948 at the Tivoli Theatre (later Her Majesty’s). It was inspired by a poem written by Walter de la Mare, and Priest used the poem’s title as the name of her ballet. It was performed to Erno Dohnanyi’s String Quartet No 2 in D flat major, Opus 15, played by the Elder String Quartet, and had designs by Kenneth Rowell, his second commission from Priest. The traveller arrives at an abandoned house which holds intimate memories…and here among “a host of phantom listeners” the conflict of his relationship with two women is re-enacted in his imagination. Dogged by the relentless interference of circumstance he tries in vain to weave into an enduring pattern his longing for the woman he loves, and his loyalty to the woman who has borne him a child. The harmony of the pattern is perpetually broken by inexorable forces, and, as in life, his struggles against them prove unavailing. In the original production Harry Haythorne danced the Traveller, Margaret Monson the Woman who Loved Him, and Lynette Tuck the Woman He Loved. 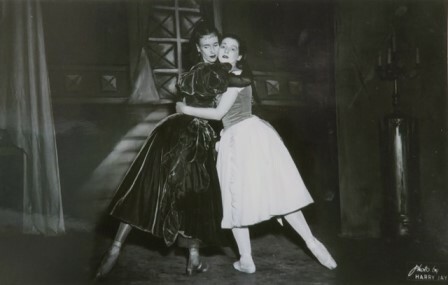 The ballet entered the repertoire of the National Theatre Ballet in 1949 with Rex Reid as the Traveller, Joyce Graeme as the Woman who Loved Him, Margaret Scott as the Woman He Loved and Jennifer Stielow as the Child. Six extra dancers were added, three men and three women, representing phantom listeners. Kenneth Rowell designed new sets and costumes for this production. The complex choreography followed the melodic structure of the music…and was firmly knit with the development of the story. What is the unexpected item? It will appear in the plates section of Dame Maggie Scott: a life in dance. Great article and love the photo of Joyce Graeme and Jennifer Stielow. Thanks Anne. I agree, great photo. More about the National to come in the book. I hope Jennifer has seen the photo. My copy arrived today, Michelle, and I wonder if the unexpected item you refer to is the very atmospheric Kenneth Rowell costume design for Margaret Scott’s character in “The Listeners”. It is very striking and well reproduced. I can’t wait to get cracking on the book. Yes, you are right. It is such a beautiful design I think. I was thrilled to discover it and am so pleased that Victoria Rowell was so accommodating in giving permission for its reproduction. There are one or two references to Ken Rowell in the book too. His correspondence with Maggie is very evocative. Happy reading. Hello Michelle, Thanks for the great ‘listener’s article of which I was not familiar although I knew the poem from my schooldays long ago. I’m trying to get some bio. information on Thadee Slavinsky who may have had some collaboration with Ms. Priest in the early 40s. I know that he had been married to Margaret Marie Doran and that he was reported as dying suddenly in Dunedin on 24/1/45 but alas there doesn’t seem to be much detail about causation nor his internment which I find somewhat peculiar. I’m also trying to source any non performing photos or perhaps a good description of him as I have heard reports of unconfirmed sightings subsequent to his apparent demise which would advance some interesting theories I have and which I would certainly share with you should they come to fruition. Great site and many thanks. Many thanks for your comment John. It would be great to have any information about Slavinsky that you might come across as you pursue your research. In the meantime, I will see if I can find out more. He is not someone about whom I have done any in depth research (so far anyway). (You would be familiar I’m sure) as well as his place and date of birth. His stated date of death I can amend to 22/12/1945 and my theory indicates that he may have concocted with the help of others to feign his demise, only to die in most unusual circumstances at Adelaide on opening night of ‘The Listener’s. The variation on Walter de la Mare’s theme by Joanna Priest fits in with our man’s love tryst and I could believe that she either had him in mind or that she collaborated to some extent with him. They almost certainly knew each other but I doubt that there were romantic links. I must add that my own research facilities are rather limited and my digital dyslexia is most inhibitive with regard to online inquiries. Cheers and thanks. Hello John. Well that is all more than interesting! Since your first comment I have found there is, apparently, some material in the National Archives of Australia relating to Slavinsky. Unfortunately the NAA material has not yet been assessed for its suitability for release to the public so I have no idea what it is about. I will, however, request that it be assessed. This process sometimes takes a few months and it may be nothing we don’t already know. But it could be interesting. I’ll keep you in the loop for sure. The National Archives has now made their Slavinsky material available online. It can be accessed at http://RecordSearch.naa.gov.au/scripts/AutoSearch.asp?Number=7846338&O=I. It largely concerns an altercation Slavinsky had at the bar in Usher’s Hotel in Sydney in October 1940. Michelle I couldn’t help but notice that slavinsky’s approved application for travel to NZ in late 44 were accompanied by another in the name of Rubenstein which was not. This would have been your Martin Rubenstein AO who will be long remembered to the Australian Ballet and deservedly. Alas poor old Thadee who had performed with the greats like Pavlova is long forgotten. I’d still like to get a natural photo of him if you should happen to see one. Once again many thanks for your interest. Yes, I was interested to see that ‘Rubenstein’ was denied approval to enter New Zealand. I assumed it was Martin and it had something to do with a Borovansky Ballet tour, although Martin spells his name Rubinstein as far as I am aware. But then I have discovered over the years many spelling errors on such official documents, and you too have commented on variant spellings of Slavinsky’s name. I will keep my eyes peeled for a Slavinsky photograph. talented young Martin Rubinstein did eventually join up with Borovansky 40 in NZ, despite have been earlier refused a travel permit due to his alien status…Cheers Michelle, as always and thanks for your interest.